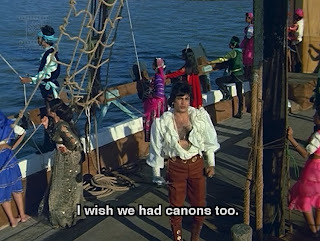 Dharam Veer is a masala TARDIS, holding waaaaaaay more R(ecommended) M(asala) A(llowance) of blinged-out boots, pirate shirts, Elizabethan doublets, Roman sandals, feisty gypsies, hand guillotines, romantic princes, creepy statues, sworn promises, lost relatives, baby-switching schemes, court politics, sword fights, naval battles, and eye-for-an-eye justice than you imagine could possibly fit inside its perfectly normal-looking DVD box - and did I mention it also travels in time? There was no way this wasn't going to be superwow. I loved every minute. 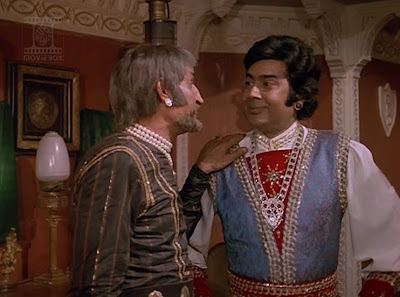 It's got all the fantastic time/place elements of Ajooba with a tighter, funnier script (though one of the same writers, the equally accomplished Masalameister Prayag Raj) and more masterly combination of RMA elements (sorry, Shashi). 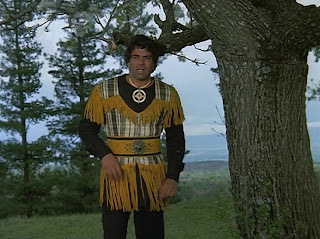 Dharam Veer has so much in it, plot- and look- and attribute-wise, that it can't fit into just one state of Masala Pradesh - don't fence it in, man! - and I think a time- and space-travel metaphor is the only thing that can properly suggest its vast ramblings. Or maybe Dharam Veer is its own state, too full of cultural, temporal, and RMA diversity to be integrated smoothly into an existing category. Rum, what say you? Whatever it's doing, and where/whenever it goes, it's at the top of its game, and I'm sure I can't do it justice - for starters, I'm bound to leave something out, but more to the point, it's one of those things that has to be seen to be believed. Actual information and deatiled affection have been ably addressed in Todd's most excellent writeup at Teleport City. Instead, in my capacity as Undersecretary for Education and Culture in the great Funkadelic State of Masala Pradesh, I humbly offer you a sampler platter of some of Desai's kid-in-a-candy-store-paletted wonders. Yippee! BLB's favorite heroine and masala-requisite Kapoor, Neetu Singh! 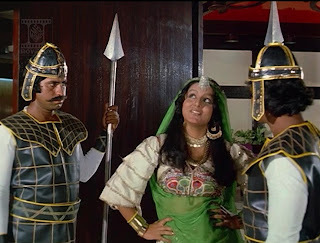 Pretty, pouty, weapon-wielding princess Zeenat Aman in an outfit my inner four-year-old loves breathlessly. and tossing off smarmy lines with obvious glee. forming the other half of a jodi so fine that it's the eight wonder of the world. As loopy good fun as they are, I occasionally wondered how this movie would have worked with Shashitabh in it, but I couldn't really imagine either of them in these roles and had to admit that other actors from the Shashitabh Epoch might also be competent in such projects. 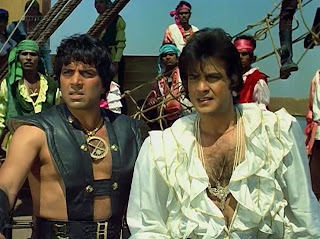 Technically I've seen Jeetendra before in Aasha, but the only thing I remember about that movie is that young Hrithik Roshan dances in it, so I'm going to count this as my first Jeetendra movie. Me like! Alright, since I brought it up: Shashi has to play Jeetendra's role, obviously. Nobody would buy Shashi as a rock-crushing blacksmith, and nobody would buy Amitabh as the royal prince if Shashi is also on screen. 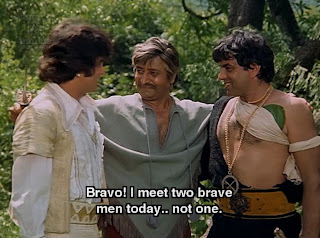 Now try to get the image of Shashi in that shirtless black strappy thing out of your head. Haha, made you wince! Oh yes, and there's also samurai! Sheroo doesn't actually talk, sadly - this text is from a voiceover of Pran's letter to the royal family - but that's his only shortcoming. 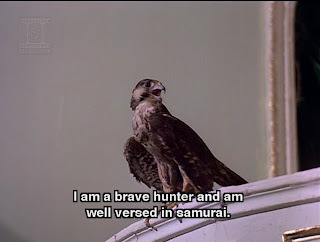 He ably participates in samurai (a term the movie uses to denote a body of knowledge about fighting and defense, a meaning totally new to me) and saves heroes in assorted ways. Proto-Shaan inside-out disco ball lounge! Yes. Let us be grateful for small favors. 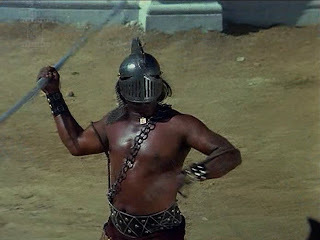 Actually, I really liked this guy (and I think he's the actor who played the thakur in Purana Mandir! 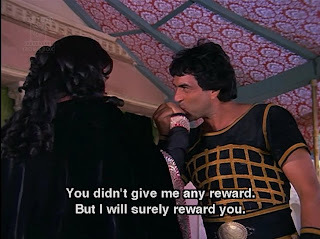 Ramsay Brothers to Manmohan Desai in one step!). He's very empathetic to the plight of a woman who doesn't want to be in her marriage. Score some feminist points for the writing staff (some of whom already have a lot for their work on Parvarish). But then they're going to lose them again for the weird "Dharmendra ties up Zeenat and drags her around while singing to her" number. The masala TARDIS comes with a very well-stocked wardrobe so that inhabitants can visually blend in in whatever temporal or spatial environment they may happen to land in. Elizabethan, for example. I hoard craft books from the 1970s, and this looks like a mash-up from a segment on how to sew costumes for the school production of The Wizard of Oz: Dorothy plaid jumper + Scarecrow yellow fringe. 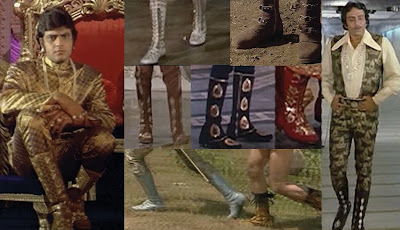 Out of all of the wonderful outfits and accessories, my favorite might be the boots. 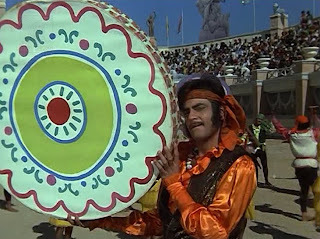 Dharam Veer is a nonstop parade of them, some of which I would, in all seriousness, gladly put on right this minute. What is Martin Crane's armchair doing in the royal palace? There might be a joke to make here. Generosity, gifts, packages, something along those lines. The location of the subtitles doesn't help, does it? Random leftovers too good to omit. Ah! And the very useful life lessons of always believing in your friends and never, ever leaving a baby alone with Jeevan. All this and much, much more awaits you in Dharam Veer - allons-y! 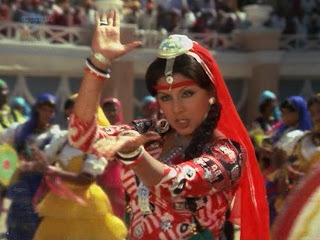 I think thats Zeenat Aman, not Parveen...this was a cool movie. Ironically, I havent seen many Manmohan Desai entertainers despite being pretty familiar with 70s and 80s. Will surely catch this one soon. Oh such fond memories of this movie! I saw this AND Amar, Akbar, Anthony on my first trip back to India in 1977 and just remember being spellbound and 'Bollywoodized' at the tender age of eight forever after. This movie is not usually not mentioned in the same breath as other classics from that time but should be. The tunes are just great and will probably get their own write up on my blog one of these days. The stars, great costumes, over the top story and great songs definitely make this a Bollyweed movie for sure (you gotta be smoking something to really enjoy it OR the makers were smoking something while filming it:) My uncle is actually a friend of Jeetendra's and said that Jeetusaab understood that he would never receive the accolades in acting other actors from that era would get - but it would be nice to be at least invited to some of the award shows. 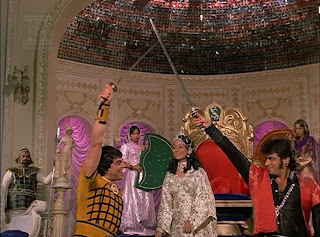 Random trivia - the song 'Jaan Jaani Janardan' from the movie Naseeb (another Manmohan Desai classic) had a calvacade of guest stars ala Om Shanti Om. The supposed occasion for all the stars? 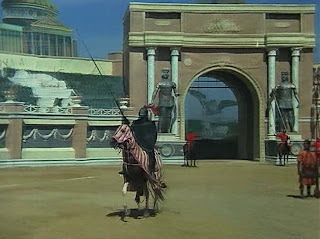 Why it was a celebration for the golden jubilee (meaning a run of 50 weeks in the theater) of this very movie! Welcome to the friends of Dharam Veer club, Beth! 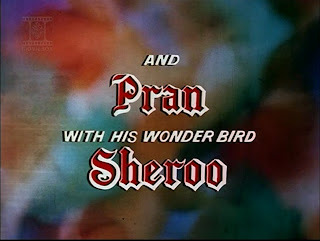 I love how that credit makes Pran and Sheroo sound like they were a package deal. 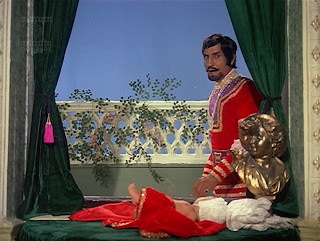 How awesome would that be if Pran always came with his own wonder bird in tow? MUST. See this movie. MUST. Ohh how i looove this movie, it makes me soooo happy and makes me love the literal bromance! though i think the highlight for me at watching this at 11, was the WONDER BIRD sheroo, who obviously reappeared in Allah Rakha, and Coolie! I adore this film (and we noticed a lot of the same things---same screen caps, I mean! great minds, blah blah ;-) The Hand Guillotine, my god the Hand Guillotine!!! (although I desperately longed for there to be knitting women sitting there too---us, perhaps, if anyone is ever foolish enough to attempt a remake? You failed to mention how hot Ranjeet is (and how pitifully unloved) though. 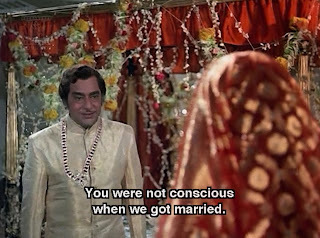 I second memsaab's commment, ranjeet was SOOOOOO SEXXXYYYYY! lol my teenage mind went into overload when he got whipped in that movie! so cute! This was my first movie in theater when I was around 9 yrs old and I had same joyful excitement after watching it as I found in your post. I have a question...why did you like this movie so much? 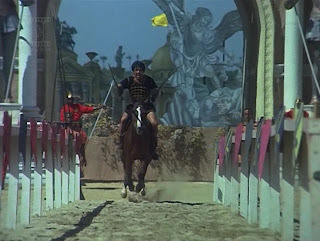 OMG, Dharam in short shorts! First thing in the morning too...there goes my appetite for the rest of the day! Thanks Beth! 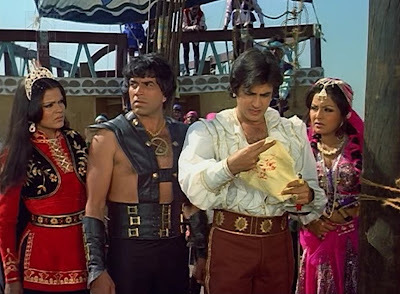 My inner 4-year old loves Zeenat's outfit too. Yum. Thanks for posting this. Well, I think even TARDIS would have some serious case of anachronia given the mishmash of era in there. For timeline mish mash, this movie really should join forces with Mard and Fantasy Mission Force, a Hong Kong movie that pits a team of mercenaries against Chinese skinheads in stretch Caddies (spray painted with swastikas) who have kidnapped Abraham Lincoln during WWII. And that summary is actually making it sound much less weird than it is. Todd already knows my master plan to train Pedro the Chimp to ride atop Sheroo the Wonder Bird, delivering fire and death to all those below...or glitter and bangles, if you've been nice. Hey so random topic, but any ideas on online Hindi movie retailers of non-pirated Hindi movies?? I mean besides Amazon? "You were not conscious when we were getting married" is a phrase I'll have to keep in mind for future use. Also, I should probably watch this. Desilicious's first, since I have the answers handy: two people (that I know of) have written up good posts on this very question! Try PPCC's Guide to Buying Indian Movies When You're Not in India and Filmi Geek's Where Can I Find These Movies?. My personal favorite sources are: my local independent video store (not helpful unless you live here, I realize), Netflix, the local Indian grocery (which rents videos), induna.com, nehaflix.com, dvddhamaka.com, and Eros Entertainment's shopping area. Desilicious - Also try Shemaroo and eBay! You can also stream movies legally (or purchase them) from jaman.com, and they have an excellent selection of parallel cinema. My personal opinion is to never buy Indian movies of any kind from Amazon - you can always find them cheaper elsewhere. Thanks, Beth! I've got my credit cards out and ready to go :) woot! (this could be very very dangerous). I should probably watch this, if only to be able to compare it to my beloved Amar Shakti. But the senior Deol (or anyone for that matter) without trousers? I am not sure I can cope; I do prefer people more covered. Completely OT, but I just learned that there is such a thing as apocalyptic art. Aaah! First an apology to desiPOLITAN for using an utterly wrong name! Bad Beth! Harsh - I'll watch Coolie and you watch this, then we'll trade impressions! :) Coolie is definitely on my list - all of Desai's are unless I've been specifically and repeatedly warned away from a particular title (which I haven't). Sanket - WOW. That's quite an indoctrination! And how symbolic - surely Desai himself could not have come up with something as rich as being en route to the motherland! I do think this film is truly great - just because it looks insane does not mean it should be dismissed. Personally I still find Parvarish (and probably AAA as well, which I now own a copy of and will be rewatching soon) richer symbolically and in terms of message, but DV is still a very fine, very fun movie. That's interesting about Jeetendra. I look forward to seeing more of his stuff. Todd - It's the bestest. 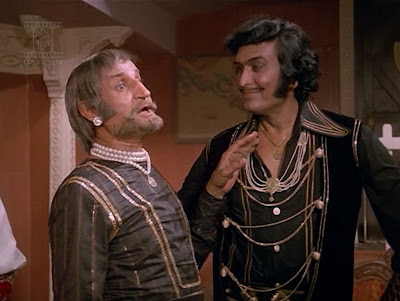 I saw another Pran movie this weekend and was disappointed at its lack of Sheroo (never mind that the movie was about a decade older than this one). bollyviewer - Yeah, I am not much struck by its dialogues, frankly. If you can figure out who everyone is without them (or if you've seen it already), I don't think they added significantly. Did you survive your nightmares? The other day I fell asleep after reading Filmfare and dreamed I was dating Hrithik. Nice! Rum - This movie requires loooooooots of vowels for expressing my appreciation of it! I soooo look forward to more Sheroo! Trust you to know where he is. memsaab - Despite its never-ending stash of good things to screen cap, there are some that are just sine qua non :) All it needs is a Defarge! I'm not with you on Ranjeet, but hey, more for you! sparkle - Isn't it DIVINE? I really love it. I wish I could make a Barbie version right now! Amey - Ha! I love that idea for a review. I'll try it for Mard, maybe! Keith - Ooooh! Lincoln! That's all this movie was missing! Let me know when the glitter chimp/bird is coming through the central US. Temple - Have you! I like him just fine though have not seen a lot of his stuff. He was fun in this - v swaggery, but that's what was called for. I have a pretty low beefcake threshold and this definitely stomped all over my sensitivities, but hey, I could always avert my eyes to the safety of...um...a puffy shirt? gold pants? Boots. LOVED the boots. When in doubt, look at their feet. house - Stop winding me up. And yes, you must. Oh, and one more note on buying DVDs: desipolitan, I have bought pirated DVDs on ebay without realizing what they were. This was when I was very new to Bollywood - and to movie-buying generally, because I think I owned about 10 DVDs total before I got into Bollywood, and most of those were gifts. I've also rented DVDs at my local Indian grocery store and been presented with a burned copy in a little plastic envelope, not the actual legit DVD in its legit box. I wish I'd had the guts to ask uncle-ji why he was charging me $2 for something that I could have downloaded for free in the convenience of my own home. Eliza - Sad! I dunno - they work for me (although they're more pixely here at work than they are on my home computer). Which banner did you get? I need to make some from this movie, that's for sure! 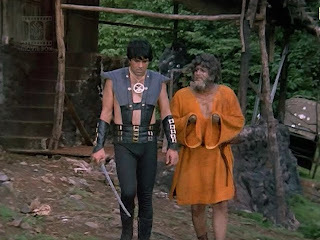 :) Dharmendra in a mini-skirt while doing metal-smithing is definitely funny, I admit. HEY DO YOU KNOW IN THE MOVIE "NASEEB" THERE WAS A PARTY IN THE HOTEL (WHERE AMITABH WORKS) TO CELEBRATE THE SUCESS OF DHARAM VEER(THE SONG IS JOHN JANNI JANARDAN). WELL I LOVE TAHT SONG AND BOTH THE MOVIES ARE DIRECTED BY MANMOHAN DESAI. FUNNY!!!!!! Beth, where are yoooooouuu? How dare you have an offline life?! Hilarious b/c here $2 gets you a)illegal, and b) a crappy envelope containing a dvd with the film title scribbled on it in marker. anon - I've heard, and it sounds fab! desipolitan - Ha! Mine has only tried it once, but I am ever vigilant! Usually rentals are the real deal in the real box, though never with the extra features disc. NEVER. It is fun to see Jitendra wearing Puffy shirts - like they had in Seinfeld.